US President Donald Trump and His Majesty King Abdullah II of Jordan in Joint Press Conference. Photo Credit: White House video screenshot. US President Trump’s pledge to put “America first” looks like it could end up badly hurting Jordan. In a leaked State Department document published by Foreign Policy, the country is scheduled for a 21.7% cut in annual aid. That’s a huge reduction, and would mean drastic cutbacks in services offered by USAID, the US government aid agency. In 2015, the last year for which full data is available, USAID spent $847 million in the country. A lot of that went to supporting Syrian refugees, as well as trying to improve democracy and essential services for Jordanians. Why, though, should Americans care about what happens in far away and relatively small Jordan? Location of Jordan. Source: CIA World Factbook. Jordan is one of the US’ most important allies in the fight against Daesh, also known as the “Islamic State”. 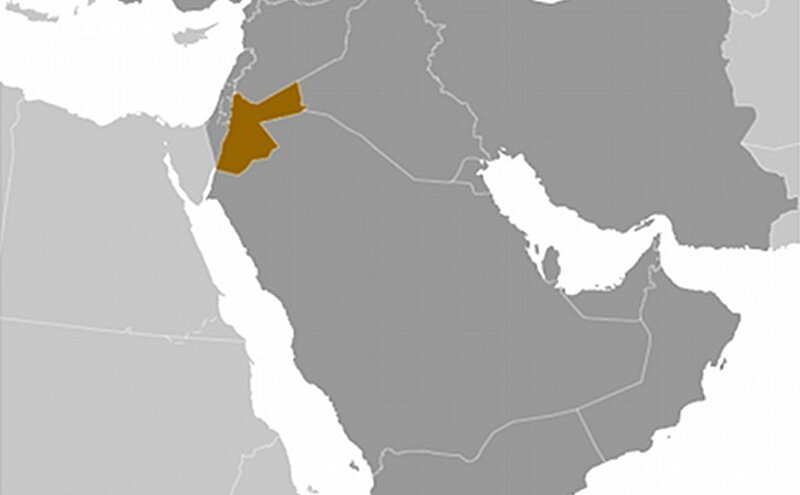 The group is present in two countries that border Jordan – Iraq and Syria – and has sometimes mounted attacks inside the country itself. Jordan was one of the most active Arab partners in the US-led coalition’s airstrikes against Daesh in Syria and Iraq. Trump has promised to “get smart” in the fight against Daesh and prevent them from attacking the US. In order to do that, the US needs to keep strong – and keep on its good side – its local allies, like Jordan, who are key bulwarks against the group. Jordan’s economy is not in a great shape. Internal dynamics play a role, but the wars in Iraq and Syria have also closed the borders and cut off some of the country’s key trade partners. The government is struggling to keep the cost of living down while simultaneously increasing the money in its coffers. Those competing demands led earlier this year to a decision to raise taxes, which caused much grumbling and some rare protests. Unemployment, a failing economy and public dissatisfaction with the government are all things that could push people into the arms of extremist groups like Daesh. Jordan has long defied gloomy predictions about future instability, but that doesn’t mean the risk of violence in the country isn’t real. Jordan has been hosting refugees for most of the country’s life. Big numbers: first of Palestinians, then Iraqis, and now Syrians. While refugees are not only a strain on a country – they also provide cheap and often unregulated labour for a country’s businesses and spend their income in the country – it can’t be denied that hosting them comes with costs for Jordan. The country has long complained that the international community is not funding enough of the services required for refugees. A big cut in US aid would only deepen that shortfall, putting more pressure on the Jordanian government to find money at a time when it is really struggling to do so. King Abdullah II was the first Arab leader to meet Trump twice. That had some speculating that he was playing a key role in forming Trump’s attitudes to foreign policy in the Middle East. Indeed, if Trump is going to do the “ultimate deal” and make peace between Israel and Palestine, then Jordan would be a key partner. It has been reported that Trump wants to mobilize improving relations between Sunni states and Israel to pressure Israel and Palestine into a deal. Jordan would be a lynchpin in those negotiations. The country has an excellent relationship with Israel, and is drawing closer to Saudi Arabia and most other Gulf states. Jordan will be a lot less likely to do America’s bidding in the region, however, if it feels it has been shortchanged by the Trump administration. While many would be happy to see America fail in its foreign policy aims in the Middle East, Jordan’s stability depends at least in part on aid not only from the US, but also from Saudi Arabia and Gulf states. That aid might be less forthcoming if Jordan can’t help them achieve their foreign policy aims, and there is no doubt that a destabilized Jordan would only serve the interests of extremists. It could be that these spending cuts won’t actually come to pass. If they do, however, it’s likely that US interests would be severely harmed in Jordan. That harm, however, would be only a fraction of the suffering that the cuts would cause to the vulnerable in Jordan, whether that’s Jordanians or refugees. Every country who receives AID has a good reason why it should not be them who receives less but the US has changed direction. It no longer is the ATM for the world while allowing it’s own country to fall into disrepair. It no longer can sacrifice itself on the fire of others. Obama made more messes than a room full of puppies. he tossed money at everything and everyone. Not for any other reason then self-aggrandizement. Still Jordan, you make a good case. The one thing I would say is if any monies goes to allies it needs be divided equally. None will get what they want but none will be awash either.